The hosts at a clan feast served salmon, seal oil, cranberries, crabapples, huckleberries, and other foods that had been harvested from the group’s exclusive territories for hunting, fishing, and gathering. The food was presented to guests in beautiful bentwood bowls, like this one collected in 1908 on the Queen Charlotte Islands. 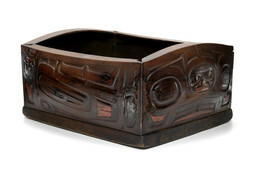 All four of the intricately carved sides are a single piece of wood, steamed and bent in order to wrap around the solid wood bottom.